When you compare this more traditional design with the funky Heinz Ketchup and Texas Pete Hot Sauce range, it could easily be a completely different company. This packaging has the appropriate flavor color coding, but everything else is a little dated. The firmer nature of these Ridged Chips made them harder and munchier than regular cut Chips. The crisp bite when bitten through was a comfortable and even crunch. These Chips were fairly narrow in the Ripple department. The seasoning was plentiful; lots of green flecks. The Chips were fairly rigid, with few broken bag constituents. The seasoning had soaked up a lot of the oil, but fingers still got messy. The Nose Plunge Test revealed a salty onion aroma. 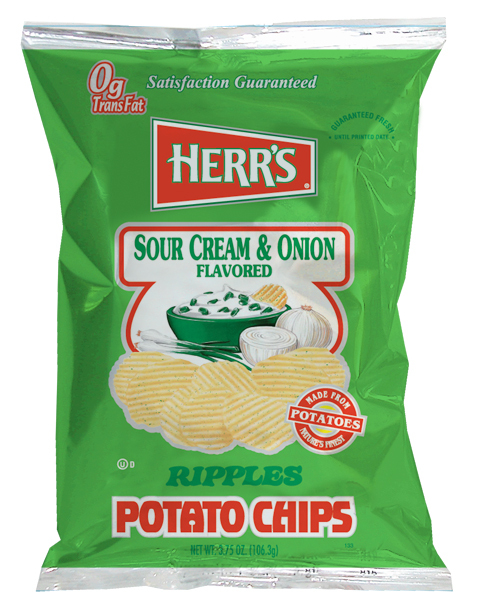 The taste was also fairly even stevens in what is often a battle between the Sour Cream and the Onion in many Chips company bags. Getting the balance right is the secret of a good version of this Chip. They were creamy and had a fair balance of onion, so a pretty good version.